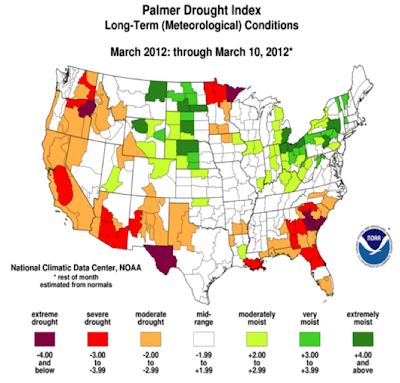 A couple of months back, I promised to start posting the US PDSI drought map once a month or so. Obviously, that has gotten off to a slow start! However, here is the map for the week of March 10th. The good news is that Texas is coming out of the dreadful drought of 2011. The not so good news is that the southeast is still moderately to extremely dry, and much of the west coast is rather dry also. From NOAA's description of the Palmer index: "The negative is that it [the Palmer Index] is not as good for short term forecasts, and is not particularly useful in calculating supplies of water locked up in snow..."
I've said this several times in various places on the internet, though no one ever seems to be interested in the comment. Considering how things are done there, I think the American Southeast is the most vulnerable are of the country to drought. I say that because they are seeing a lot of it lately and the climate forecasts seem to indicate they will see more. This area of the country while it will almost certainly continue to receive more rain than the Southwest is totally unprepared for managing water. They use a lot, but they have none of the infrastructure to deal with it. A couple of years ago Atlanta was very close to basically drinking the dregs of Lake Lanier. I don't know what that city does without water. Take all the Savannah River system for itself? The smaller municipalities down there are in far worse shape. Absolutely no water management infrastructure in general and no money to put it in place unless the federal government gives them the money, as they have so many times before. Even if they do (and I guess they will), it will take a number of years to actually construct these works. Add to that the fact that most of the rural south (and it is still quite large) depends on groundwater for household use and some agriculture. These aquifers aren't in as bad a shape as the southern portions of the Oglalla but they are getting strained in a lot of places. A lot of these places are economically marginal already, and rising gas prices and the need to redrill wells deeper could tip these areas. Government transfer payments of various sorts (military pensions, social security, various other social spending) are pretty much what keeps it afloat. Not to mention the fact that roads and rural electric service are a product of the government in the end anyway. Just saying that while the southeast will most likely continue to get more rain than the southwest, I just think this area is more vulnerable to a long term drought than any other segment of the US.